I joined Andy Field at the East Mersea Point on a cold and grey Sunday 30th, so that I could try and see the big flock of 34 snow buntings that he'd found early in the morning. Unfortunately the birds had taken off by the time I got there and had flown east across the Colne to the beach at Point Clear. This is the biggest flock of snow buntings to have been seen so far this winter here, although there had been a report of about 25 birds seen here the day before. In the river Colne we saw two eiders treat us to a nice fly-past as they headed up river, dropping down near Rat Island. Ten red-breasted mergansers were busy doing lots of diving under for food, with several big gulls waiting nearby to see what they brought back up. A female common scoter was seen in the outer part of the estuary and there was a fly-past from one goldeneye. About five great crested grebes were also seen in the river. One common seal swam slowly out of the river, popping up every so often to stare at us, while a bit later a second seal was seen just in the Pyefleet. 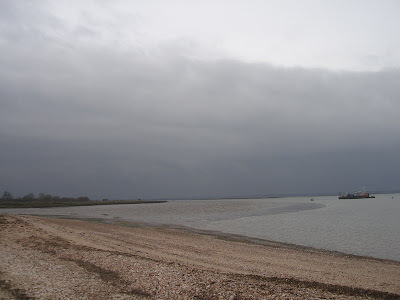 As the tide came in, many waders started to gather on the nearby mud by the Point under a dark grey sky as pictured below, Howard Vaughan with his group of birdwatchers from south Essex, managed to find a curlew sandpiper feeding on the mud - a winter rarity for Mersea. Apart from the usual frenzied wader activity in this area, there were 70 avocets seen and a roost of about 400 golden plover. On Langenhoe 5 marsh harriers circled above the reedbed lagoon at the Point, while nearby on the Rat Island a peregrine was seen a couple of times doing some low-level flights, disturbing flocks of birds before settling down on a low post in the saltmarsh. Amongst the oystercatcher roost on the Point were a reasonable roost of godwits, the majority appearing to be bar-tailed with at least 20 birds present. On some distant bushes on Langenhoe were 50 fieldfares flying about. On the park grazing fields most of the bird activity seemed to be around the recently flooded sections of the fields. There was a nice selection of wigeon, teal, mallard, moorhens, redshank, curlew and black-tailed godwits all enjoying the wet conditions. The regular flock of 50 goldfinches were still present and 3 stock doves were also noted. A sparrowhawk was seen flashing low across the park in the middle of the day and then just after nightfall, there was a good view in the car headlights of a tawny owl, perched just inside the park entrance. Four winter moths gathered round the lit window after dark at the house in the park. 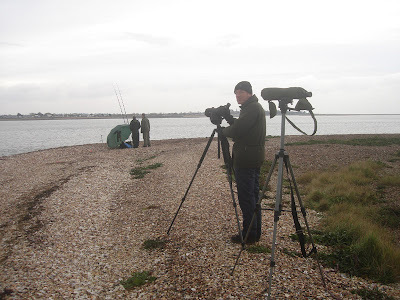 Off shore from the esplanade at West Mersea, Howard and his group later saw 4 great northern divers. The previous day Graham Ekins had seen 2 great northern divers, Slavonian grebe, shag, common scoter, 5 goldeneye, Mediterranean gull and 12 red-breasted mergansers. By the Strood he also noted the big flock of 3000 golden plovers and also 200 knot.